This dataset provides flight track and aircraft navigation data from the NASA Atmospheric Tomography Mission (ATom). Flight track information is available for the four ATom campaigns: ATom-1, ATom-2, ATom-3, and ATom-4. Each ATom campaign consists of multiple individual flights and flight navigational information is recorded in 10-second intervals. Data available for each flight includes research flight number, date, and start and stop time of each 10-second interval. In addition, latitude, longitude, altitude, pressure and temperature is included at each 10-second interval. NASA's ATom campaign deploys an extensive gas and aerosol payload on the NASA DC-8 aircraft for systematic, global-scale sampling of the atmosphere, profiling continuously from 0.2 to 12 km altitude. Flights occurred in each of 4 seasons from 2016 to 2018. During each campaign, flights originate from the Armstrong Flight Research Center in Palmdale, California, fly north to the western Arctic, south to the South Pacific, east to the Atlantic, north to Greenland, and return to California across central North America. ATom establishes a single, contiguous, global-scale dataset. One intended use of this flight track data is to facilitate to mapping model results from global models onto the precise ATom flight tracks for comparison. This dataset contains 8 data files; 4 comma delimited (*.csv), and 4 keyhole markup language (*.kml) files. The csv and KML files contain the same data with the exception of the csv files providing metadata information in the header of the file. 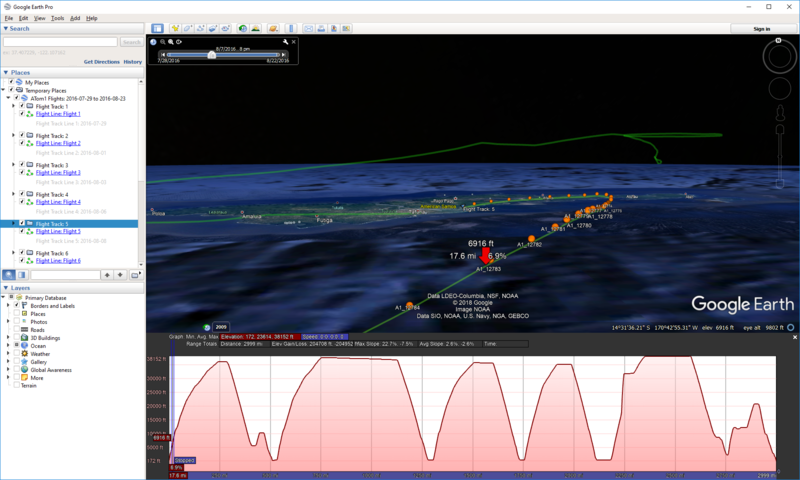 Figure 1: Flight tracks KML file displayed in Google Earth showing part of the flight path and 10 second interval points for Flight 5 flown on August 8, 2016 of the ATom-1 campaign. The elevation profile of the entire flight is shown on the bottom pane. This dataset provides flight track and aircraft navigation data from the NASA Atmospheric Tomography Mission (ATom). Flight track information is available for the four ATom campaigns: ATom-1, ATom-2, ATom-3, and ATom-4. Data available for each flight includes research flight number, date, and start and stop time of each 10-second interval. In addition, latitude, longitude, altitude, pressure and temperature is included at each 10-second interval. One intended use of this flight track data is to facilitate to mapping model results from global models onto the precise ATom flight tracks for comparison. Spatial Coverage: Flights begin in California, fly north to the western Arctic, south to the South Pacific, east to the southern Atlantic, north to Greenland, and return to California across central North America. Temporal Coverage: Periodic flights occurred during each deployment. Temporal Resolution: Each navigation point is presented every 10-seconds. This dataset contains 8 data files; 4 comma delimited (*.csv), and 4 keyhole markup language (*.kml) files. The csv and KML files contain the same data with the exception of the csv files providing several rows of metadata information in the header of the file. There is one csv and one kml file per campaign (ATom-1, 2, 3 & 4), and within a campaign file, the individual flights are indicated by the Research Flight Number. Naming conventions are the same for both file formats. Files are indicated by each ATom# campaign, where # is 1, 2, 3, or 4. ATom builds the scientific foundation for mitigation of short-lived climate forcers, in particular methane (CH4), tropospheric ozone (O3), and Black Carbon aerosols (BC). ATom delivers unique data and analysis to address the Science Mission Directorate objectives of acquiring “datasets that identify and characterize important phenomena in the changing Earth system” and “measurements that address weaknesses in current Earth system models leading to improvement in modeling capabilities.” ATom will provide unprecedented challenges to the CCMs used as policy tools for climate change assessments, with comprehensive data on atmospheric chemical reactivity at global scales, and will work closely with modeling teams to translate ATom data to better, more reliable CCMs. ATom provides extraordinary validation data for remote sensing. None provided for the navigational data. ATom makes global-scale measurements of the chemistry of the atmosphere using the NASA DC-8 aircraft. Flights span the Pacific and Atlantic Oceans, nearly pole-to-pole, in continuous profiling mode, covering remote regions that might have been regarded as pristine 20 years ago but today receive long-range inputs of pollution from expanding industrial economies. The payload has proven instruments for in situ measurements of reactive and long-lived gases, diagnostic chemical tracers, and aerosol size, number, and composition, plus spectrally resolved solar radiation and meteorological parameters.